1977. The DHARMA Initiative is building its scientific stations on the mysterious Island and has an uneasy truce with the native 'Hostiles'. For three years security chief Jim LaFleur has kept the peace, but when some old friends arrive, his life is thrown into turmoil. The final act of Lost's fifth and penultimate season sees the narrative split between two times, with characters in the past striving to change history so the fateful crash of Oceanic 815 never happens and in the present, searching for answers to some of the Island's bigger mysteries. This splintered form of storytelling means that characters are kept separate from one another for many episodes in a row, but it is also necessary to move the story forward and into the show's final season. Some Like It Hoth sees Lost easing off the gas pedal and relaxing a little to give us a lighter story about Hurley, Miles and Dr. Chang. We learn a lot more about Miles, always the most laidback and quietest of the 'freighties' introduced in Season 4, and actor Ken Leung gets a chance to shine after a lot of time spent as a supporting character. For all of its foreshadowing as a comedy episode - and Hurley gets the most harebrained but brilliant idea relating to the time travel shenanigans so far - there's actually an impressive amount of plot movement and building of the mythology of the series here, although not as much as in some recent episodes. It's a fun episode, although the show's obsession with 'daddy issues' is getting wearying. The Variable is a sequel to Season 4's Hugo-nominated episode The Constant, which means it has a lot to live up to. We pick up on Faraday's story after his encounter with Desmond in the past in that episode (we also get flashbacks to earlier moments as well) and learn more about his relationship with his mother and how he got on the freighter at the start of Season 4. In the 1977 storyline, Faraday has learned something important and rushes to make contact with the Hostiles, dragging a reluctant Kate and a suddenly-enthused Jack along to help out. This episode tries to do a lot but overreaches, and its allegedly shocking conclusion is only made possible by having Faraday act very out-of-character. Some nice moments and a couple of big questions are answered, but this is a slightly disappointing episode. The two-part finale, The Incident, certainly opens in an unexpected way with the biggest flashback to date, taking us back some 150 years to the day the Black Rock arrived on the Island. At this time the Island is home to only two men, one of whom is called Jacob. As the episode unfolds, we see through flashbacks that Jacob has had a hand in some of the formative events of many our familiar characters' lives, but simultaneously an uneasy question is raised: if Jacob could leave or at least project an image of himself off the Island, why was he living in that shack in the woods, begging Locke for help, back in Season 3? The finale unfolds with the traditional Lost gunfights and explosions in the past storyline, whilst in the present Locke gives Ben a shocking mission. Events build through the two episodes, but it has to be said that the finale does not feel as jam-packed with events as the previous four. Instead there's an atmosphere of doom and 'wrongness' in the present-day storyline culminating in a truly jaw-dropping moment (again, Emerson is key in this scene) when everything you ever thought you knew about the show had to be re-assessed on the fly, and the show's central 'battle' that has been hinted at since Season 1 is seemingly, finally defined. Unfortunately, the 1977 story runs out of steam a good quarter-hour before the final moments of the episode, and some truly contrived and hackneyed plot devices are used to get characters to where the writers want them (the use of a length of chain is particularly grating). The final moments are effective, and leave Lost on its most demented cliffhanger ending to date. Since Season 6 is the final season of the show, this is the last big season cliffhanger and they wanted to go out on a note as bonkers as possible (and at the same time give an effective shout-out to the Season 1 finale), but it felt a little ineffective compared to previous cliffhangers. 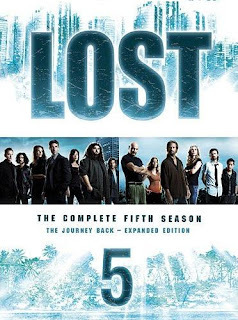 Season 5 of Lost ended strongly, although towards the end of the season there was the feeling that the show was starting to stagger slightly under the weight of its mythology. The complexity of the plot has reached saturation point and the introduction of yet more characters and a possible new faction in the closing episodes felt unwarranted, but the finale did a good job of re-focusing the viewer on the question of what is really going on with this Island, what its purpose is and why various groups have been drawn to it over the centuries. This re-statement of the show's purpose will hopefully be followed through in the final season. It's actually rather bemusing to think there are only 17 hours of the show left, in which time a lot of questions need to be answered. The excellent pacing of Season 5 has left me confident that they can deliver these answers. I'm guessing we'll find out in less than a year. About Jacob in the cabin, I don't think that was him. Illana said someone else had been using the cabin, so probably Man #2/Esau/Flocke/Smokey. It is interesting that the guy in the cabin had brown eyes and I believe both Jacob and Man#2 have blue. However, if Man#2 can only exist by taking on other people's forms (shades of the First Evil in BUFFY), then he may have been inhabiting a different form at that time. I'm also wondering if that is the point that he 'marked' Locke to be his new form. Maybe Locke scuffed out the ash circle whilst he was fleeing?